The family truckster from National Lampoon is an image burned into many of our minds of what the great American road trip used to look like. In the pre-internet and crossover SUV days, packing the whole family into the station wagon and setting off across the country was just something you did every summer. Even if it was against your will, you’d end up cramped in the back seat with your family. Stations wagons were often the preferred mode of transportation, as the long roof provided plenty of space to store everything a family would need for two-weeks on the road. Wagons have slowly faded from the US market, replaced with SUVs of all sizes. Indeed today, there are only a dozen options left for the American buyer. As the only one of those offering a 603 horsepower 4.0-liter V8, the Mercedes AMG E63 S wagon is a serious German muscle wagon. It’s not just fast in a straight line, but it also happens to be fun when set loose on a race track. That’s not the usual place you’ll find a station wagon, I know. So, Mercedes-AMG gathered up its fieriest options in the AMG Fast Family Haulers line, and invited us out to Nashville, Tennessee to drive the GLC 63 SUV, GLC 63 and GLC 63 S Coupe, and the E63 S Sedan and Wagon. I’d start my day in the 469-Horsepower GLC 63 SUV along with a 170-mile route heading east out of Nashville and through the backwoods of Tennessee and Kentucky, to our destination, NCM Motorsports Park in Bowling Green, Kentucky. Entering the Tennessee highway, I moved my hand over and toggled the AMG Dynamic select into Sport+, the transmission makes a smooth downshift, the exhaust lets out two bangs, and the suspension stiffens. Now, this is the GLC 63 that I was expecting, but that’s part of what makes these active vehicle systems so great. When the driver wants a loud and obnoxious ride, it’s only a matter of nudging a selector and the whole dynamic of this monster SUV changes. The AMG chassis-tuning engineers worked their magic, and they removed most of the typical SUV feel. You know that sensation when you attempt to drive an SUV like a sedan? The extra body roll you encounter due to the higher center of gravity causes your brain to lift off the throttle earlier when entering a turn quickly. In the GLC 63, the AMG-tuned active systems work together to attempt to rebalance the center of gravity, which in turn helps to provide a more sedan-like feeling. The AMG air body control, dynamic cornering assist, 4MATIC+ all-wheel drive with fully variable torque distribution, and AMG limited-slip differential all collaborate perfectly, while the AMG Multi-Chamber Sport Suspension has been engineered to work more efficiently with what’s still a bigger vehicle. Passing through the Tennessee and Kentucky tight and twisty backroads with their 55 MPH speed limits was surprising fun, and I was amazed at how in control the drive felt and just how much power was available. After 170-miles of twisting Tennesee and Kentucky asphalt, I pulled into the parking lot at NCM Motorsports Park. Waiting for me on the track was a brand new AMG GT R pace car, painted in Green Hell Magno, and looking fairly different from the four Mercedes AMG E63 S Sedans and two E63 S Wagons parked behind it. As soon as I opened the doors of the GLC, the skies opened up. Nonetheless, the weather wouldn’t deter from our fun, and our instructor and pace car driver – the legendary Tommy Kendall – assured me that it would be business as usual. The Mercedes E63 S Sedan and Wagon both pack over 600-horsepower under their hoods. The high horsepower German wagon is the Holy Grail of the enthusiast community, and though not widely purchased it is certainly highly coveted. As the number of wagons on the market has slimmed, the more outlandish options have risen to the surface. Slide into the AMG Performance front seats, and you immediately lose the sense that you’re sitting in 2-ton wagon, especially once you press the engine start button and the V8 roars to life. With the seat and mirrors adjusted, Tommy calls over the radio for one last check, and we drive out of the pit lane and enter the first tight right turn of the track. The opening laps will be slow, he cautions, as we need to learn the track before applying any of the power. Particularly wise, I suspect, on a track with turns named Deception, Faux Rouge, and the Sink Hole. After two laps, though, it’s time to switch the AMG dynamic select to Sport+, while leaving the suspension in the comfort mode. The AMG GT R started picking up speed now, and with Tommy still talking us through each turn, the group was getting faster with each pass. Once we reached the start/finish line, the leading car would fall to the back of the line so that we could all have our chance to be behind the pace car. Even so, with the rain seriously hammering down at this point, I could only see the GT R from the occasional glow of its brake lights. That didn’t slow us – or the AMG – down. The E63 is more than capable in all weather conditions, particularly with the proper tires installed, but that doesn’t mean exotic rubber. Indeed, the factory-fit Michelin Pilot Sport 4 S tires provided all the grip that we needed to keep on line. After the rain died down, it was a chance to pick up the speed again and try to apply more throttle when exiting the turns, encouraging the back to slide out. The advice to keep your eyes up, look where you want to go, and rely on your hands and the car to do the rest seems counter-intuitive at first, particularly when you have a beefy station wagon swinging around you, but it works. With the rain receding and the track starting to dry, it was time to dig into more of that 600-horsepower without fear of the puddles that had quickly begun to form. My confidence building, and my lap times trimming, it was time to switch cars, and I jumped into the E63 Sedan. After the first two laps, though, I was missing the wagon. The extra weight over the rear delivers a grip advantage that the sedan just didn’t have. All the same, the incredible noises from the exhaust are the same, and the amount of grip that both cars possess is incredible. Those who are particularly brave can set the 4MATIC+ system to rear-wheel-drive only. Conditions conspired against us trying it out on what was still a treacherous track, since without traction control both sedan and wagon will certainly be a handful, and only for the highest skilled driver. If there’s one thing clear to me, it’s that these luxury vehicles are not just happy on the highway, and our few hours at the track indeed proved that they could be ridiculously fun when pushed hard. While you probably won’t be setting the sort of records that the AMG GT R is capable of, you will be able to enjoy track days no problem. As track time came to a close, I hit the highway back to Nashville in the E63 S wagon. The highway drive would be a much shorter route, but it was more than enough to demonstrate another demeanor that the wagon can offer. As smooth and effortless as you’d imagine from the three-pointed star, no less, and even in the stop-go traffic building outside the city it was hardly a headache to deal with Mercedes’ various active driver assistance aids. The new 9-speed transmission handled traffic just as capably as it dealt with chasing Tommy’s lap car. 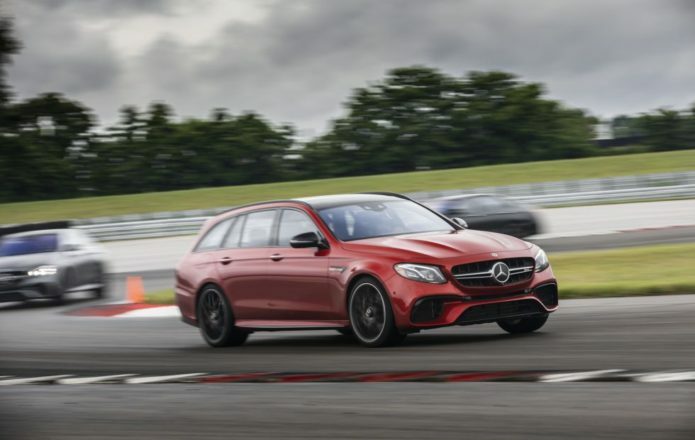 They were talents the E63 S wagon doubled-down on the following day, in a winding route that took me around Nashville’s highways, out to some very rural roads, and then finally on a course through the city itself. Very different roads, but perfect to demonstrate the range of personalities the AMG dynamic select system offers, and its ability to transform the driving experience. If you wanted, you could undoubtedly drift all the turns through town, but a more civilized person would probably save that for the track. Still, with sport mode selected and the exhaust system opened up, it’s definitely one way to make a statement in the city. Switch over to comfort mode, though, and you can instead blend in with this very understated wagon. Only the most trained eyes will be able to recognize what you are driving, and the power lurking under the hood. It may come as little surprise, therefore, that I now want the E63 S wagon to be my daily driver. It’s practical, spacious, capable of some surprisingly good gas mileage – for what it is – and even allows you to cut loose at the track when you need that extra little bit of stress relief. Indeed the only real downside is the cost of entry: the AMG’s $107k starting price is the most significant barrier to driving a car like this every day. As an antidote to SUV boredom, however, the benefits of this stealthily-stupendous wagon far outweigh its cost.